You won't hear city locals calling out a bad time of year to visit Toronto, because, no matter the season, there is always something going on and a way to make the most of any type of weather. April though, in particular, has a lot going for it, including the fact that the temperatures will most likely be above zero. The Toronto crowd will have a palpable spring in their step as the warmer weather starts to settle in once again following a long winter. So, in addition to boasting more civilized temps, April is also generally a down time for travel, which means savings for travelers looking to explore the city. Discounted flights, hotels and travel packages are abundant, so do your research and grab a deal if you can. The beginning of spring is good timing to get in the last of winter sports, like spring skiing, but also hit a patio or go for a hike without suffocating in a parka, depending on April temperatures. Weather in Toronto in April is usually unpredictable. Snow is not unheard of, but temperatures can get into the 30s°C (85+°F). On a given day during the month you might find yourself having a drink on a newly-opened patio, or on the other side of the spectrum, going for a snowy walk. Toronto has a short, mild spring. Visitors can expect at least some rain, about 11 days out of 30 in April. The best advice for packing for April in Toronto is to bring clothes for four seasons—it may snow, rain, be sunny or fall anywhere in between. Dress in layers and be sure to bring water-resistant outerwear, although a heavy parka or boots are not necessary, and even if they are, layering up will be easier for packing. There are quite a few things going on in Toronto during April as the city begins to come out of a collective winter hibernation. Hot Docs International Documentary Film Festival: Fans of documentary films who will be in Toronto towards the end of April will want to put Hot Docs on their radar. Happening April 25 to May 5, 2019, the popular event is North America’s largest documentary festival featuring over 200 films from Canada and around the world. Images Festival: You can expect a myriad of unique and thought-provoking screenings, exhibitions and performances highlighting the work of local and national independent artists, photographers and filmmakers at Toronto’s annual Images Festival, happening April 11 to 18, 2019. Fashion Art Toronto: Fashion Art Toronto (FAT) is a multifaceted, five-day showcase of experimental, art-influenced fashion runway shows, performances, art installations, photography and short film by 200 Canadian and International fashion designers and artists. FAT is happening in Toronto April 24 to 28, 2019. Record Store Day: While Record Store Day is an international event, in Toronto you can expect the city’s independent record stores (of which there are many) to be holding events on April 21. Riverside Wine and Craft Beer Fest: Toronto’s Riverside neighbourhood along Queen St East will be home to this beer and wine-focused fest April 2 to 6, 2019. Visitors can sample good from award-winning Ontario wineries and local breweries from all over Ontario. High Park cherry blossoms: Depending on how warm April turns out to be in Toronto, you may get a chance to see the plethora of cherry blossoms that pop open in High Park creating a canopy of the pretty pink blooms. If April turns out to be warm, the end of April can be a good time to visit. See the cherry blossoms around Hillside Gardens and near the park’s duck pond. Easter in Canada occurs sometime in March / April (the dates change year to year). Check ahead for holiday closures. Rainfall and snow melting can cause muddy conditions in parks so be mindful when planning activities. Since April is still low season in Toronto, there is a good chance major attractions won’t be too busy and you may be able to find deals on hotel rooms. 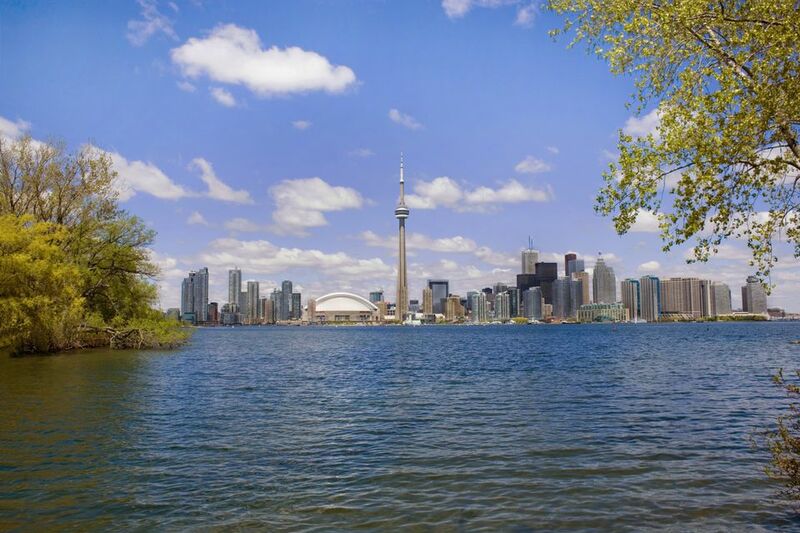 If you’re curious about weather in Toronto at other times of year, check out this guide covering climate, seasons and average monthly temperatures in the city.